“To Die For Banana Bread” is a proud exhibitor of EPIC Expo, happening this weekend from Friday, May 11 until Sunday, May 13 at the Vancouver Convention Centre West. 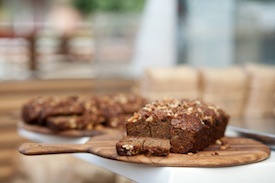 Over 500 samples of bread will be ready and waiting for guests this Saturday only, from noon to 4pm. Find us in the EPICurean Corner next to Terra Breads – just look for ladies in yellow.